October 5, 2009 – Approximately 200 bishops from 53 African states came together yesterday in the Vatican to celebrate mass for the opening of the synod on Africa, with the purpose of addressing many of the challenges that the Universal Church is facing in the continent. 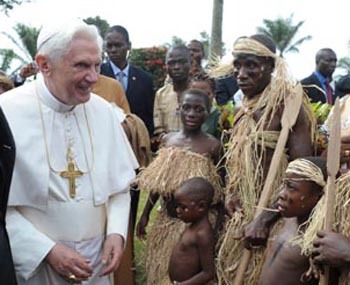 Pope Benedict XVI stated that Africa’s rich cultural and spiritual treasures are the “spiritual lung” for a world facing crisis and hope, further stating that Africa is being afflicted by “toxic spiritual garbage”, the result of materialism and fundamentalism. Statistics from the Vatican show that 17% of Africa’s population is Catholic. The Universal Church’s presence on the continent has grown enormously over the past few decades. Reportedly, from the years of 1978-2007 the number of faithful Catholics in Africa grew from 55 million to 146 million. Pope Benedict has urged for less fundamentalism from groups of missionaries claiming to be from religious backgrounds but promoting religious intolerance and violence, the Pope referred to this as a “virus” threatening the region. He urged the Catholic Church in Africa to be a voice of reconciliation, justice and peace among the continent’s various ethnic and religious groups.